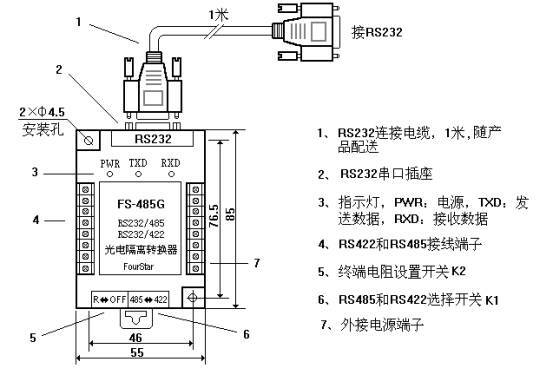 FS-485G is to realize communication conversion from RS232 to RS485 and RS422. This product needs to externally connect 5V DC. There are DC / DC isolated power modules and high-speed isolated in the product to respectively realize the isolation of the power and signal. Use the unique zero-delay automatic sending and receiving conversion technique and baud rate adaptive technique. Plug-and-play, suit for all software, and in the high resistance state when not sending data. Support multi-point communication, which is different from other similar cheap products in market. There is a built-in anti-static anti-lightning circuit in the product. Uniquely with power and sending/receiving indicator lights, the shape is the industrial structure of standard rail installation. 7, the largest number of network site is 128. FS-485G can connect any RS232 serial interface, the RS232 socket of this product is defined by standard DTE interface. cable can be used to connect standard DCE interface. A crossover cable is needed for the DTE interface such as computer, as shown below , and this cable is incidental with the product. For other RS232 mouth witch didn’t array as standard signals, users should link sending to receiving, receiving to sending. FS-485G can be used for point-to-point communications and multi-point communications. 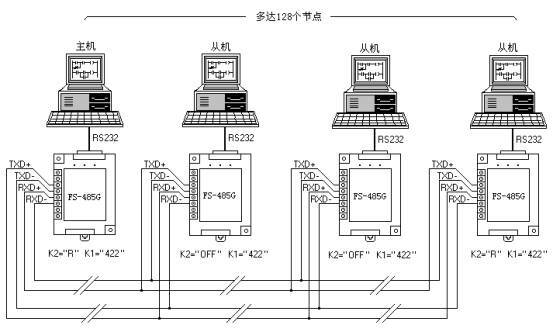 Except for linking several other RS485/422 interfaces, it can also make as many as 128 RS232 interfaces compose of RS485 or RS422 communication network, its communication range is up to 3km（4800bps）、2km（9600bps）. The addresses of each nodes are determined by the internal procedures of the equipment. Please connect the shield to the "FG" terminal of products when using shielded twisted pair,. 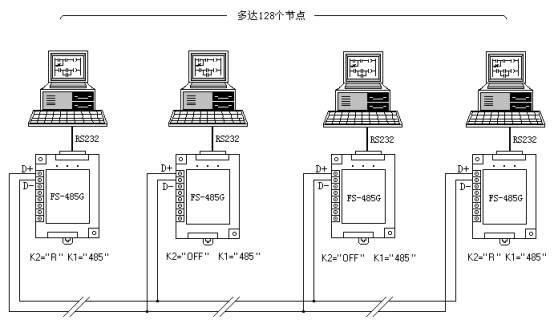 Turn the RS485 and RS422 selection switch K1 of FS-485G converters to "485", the terminal resistance setting switch K2 on FS-485G of network’s terminal and start to "R", the terminal resistance setting switch K2 on other FS-485G of the network to "OFF". 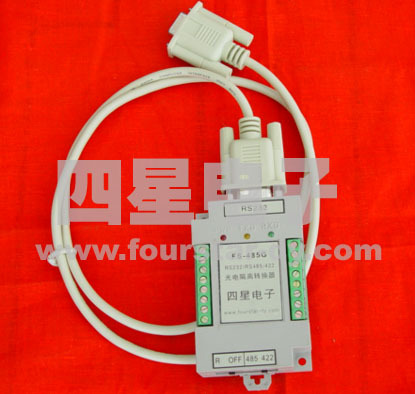 Turn the RS485 and RS422 selection switch K1 of FS-485G converters to "422", the terminal resistance setting switch K2 on FS-485G of network’s terminal and start to "R", the terminal resistance setting switch K2 on other FS-485G of the network to "OFF".